Realizing they were being driven out of their lands and believing that the white men had not fulfilled the terms of several treaties, the attacks continued. In 1867-68, some 210 people were killed by Indians in Kansas. Union Pacific Railroad tracks reached the town of Sheridan, Kansas in June 1868, and then westbound freight headed southwest over a wagon road to Fort Lyon, Colorado on the main trail. The Cimarron Route was abandoned after that time, and most long-distance Mountain Route traffic ceased east of Fort Lyon. There was the desert mirage, a will-o’-the wisp that beckoned and taunted. Sometimes it would look like a party of mounted Indians, and the women would cry and begin counting their children. 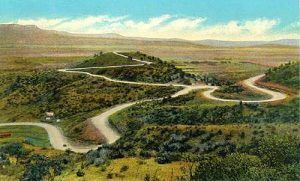 Though the Mountain Route of the Santa Fe Trail presented some problems, especially the crossing over Raton Pass, it most definitely had its advantages, including the fact that it had plenty of water and was relatively safe from Indian attacks. About 100 miles longer than the Cimarron Route, it became the favored route at various times due to drought and hostile Indian raids along the Cimarron Cutoff through the southwest corner of Kansas and the Oklahoma panhandle. The Mountain Branch of the Santa Fe Trail continued to follow the Arkansas River from west of Dodge City, through Gray, Finney, Kearny and Hamilton Counties of Kansas. Through this area of southwest Kansas, several historic sites and Santa Fe Trail ruts can still be seen, including the Cimarron Crossing, a natural landmark called Indian Mound, the site of old Fort Aubrey, and more. The trail then made its way into Colorado passing by the site of Old Granada, Bent’s Fort, Boggsville, Fort Lyon, and the old Wooton Ranch, before making its way along the treacherous, steep and unforgiving Raton Pass. Through here, wagons often had to be dismantled and hoisted over rocks and ledges, a process that could add days to the trip to Santa Fe. Early travelers observed broken remnants of wagons strewn all along the way over Raton Pass. The Cimarron Cutoff became the most popular road to Santa Fe in the early years of the trail as it avoided Raton Pass and was more suited to wagon travel. It was also shorter by over one hundred miles and if a savvy trader could beat his competition to Santa Fe that only meant more profit. But the Cimarron Cutoff had its problems too. After crossing the Arkansas River west of present-day Dodge City, Kansas, it was a waterless route until the traders reached the Cimarron River (which could be dry too in certain years) furthermore it went right through the heart of Comanche and Kiowa territory making it more prone to Indian attack. However, the Mountain Branch became the favored route over the years due to the dramatic increase of Indian attacks caused by more and more people entering into their territory. The route of the Mountain Branch follows present-day I-25 over Raton Pass (along the railroad tracks) and parallels Highway 64 to Cimarron, New Mexico crossing in front of the Visitor Center and across the Cimarron River to Old Town. 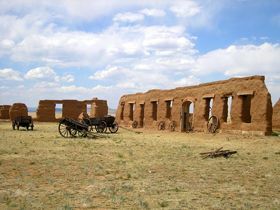 The two branches converged near the modern town of Watrous, New Mexico, and the sprawling complex of Fort Union. It then continued through several Hispanic settlements and the historic ruins of Pecos Pueblo, before it, at last, emerged from the passes of the Sangre de Cristo Mountains and into the Santa Fe Plaza. Regardless of which path the travelers chose to take, they faced many hardships along the Santa Fe Trail. The caravans could not escape the harsh Plains, desert, and mountain elements along the 900-mile trek. These included dry spells, torrential rains, huge lightning storms, wolves, fires, and stampeding bison herds. Summers were very hot and dry, and the winters were often long and bitterly cold. Lack of food and water also made the trail very risky. River crossings were particularly troublesome. Although shallow, Plains rivers were filled with sinkholes, quicksand, and other hazards that required careful maneuvering. In 1825, Congress voted for federal protection for the Santa Fe Trail, even though much of it lay in the Mexican territory. Though the Cimarron Route was much more prone to Indian attacks, raids intensified all along the trail as the Native economies began to crumble, making the Santa Fe trade a dangerous business. Over time travelers began to use more oxen instead of horses and mules because the Indians did not want to risk raiding the caravans for only some oxen. For years after the trail had fallen into disuse, it was marked by an unbroken string of destroyed wagons, animal remains, and the remains of old supplies. The map on the top right of the article could be very useful, but it is too small to read. A link to a larger image (a very large image, even) would be much appreciated. Thanks Rosina! I’ve updated the page where you can click to see a larger version. Looks like all I could get was 500px wide, but it should be easier to see when you click on it now.